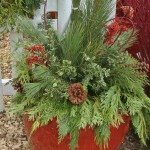 As winter beckons, plan on adding winter greens, red dogwood stems, curly willow, berry branches and many more types of greenery found at The Growing Place to bring a taste of Christmas to your containers. Thick-walled, high-fired ceramics, cast iron, and concrete will do well outdoors if prepared. Make sure these types of pots are raised and have drainage holes. Empty out some of the old soil and add foam blocks or peanuts, bubble wrap, bark mulch – anything that can contract and expand with ice and snow. If you add greens and branches to decorate your containers, make sure to water your pots every three or four days until they freeze to keep greens fresh. The most important thing to think about as you prepare your containers for winter is water. Check for areas in your containers that collect water such as lips, curves, or depressions. Water will freeze in these spots and can cause cracks or chips. Not every container is suitable for our Chicago winters, so plan to bring most glazed ceramics and terracotta in to the garage or basement when our temperatures consistently dip below freezing. For these and containers that may collect water, dry them thoroughly, flip them over and make sure they are protected from the winter weather, for example under eaves, in the garage or on the porch.